Transparency Market Research (TMR) has published a new report titled, “Telemedicine Technologies & Services Market - Global Industry Analysis, Size, Share, Growth, Trends, and Forecast, 2017–2025”. According to the report, the global telemedicine technologies & services market was valued at US$ 21,000 Mn in 2016 and is projected to expand at a CAGR of 15% from 2017 to 2025. The report suggests that rise in geriatric population, increase in prevalence of chronic diseases such as diabetes, cardiovascular diseases, and others, surge in demand for self-care devices/solutions, increase in penetration of smartphones and Internet services, and shortage of health care personnel are likely to drive the telemedicine technologies & services market from 2017 to 2025. The global telemedicine technologies & services market is driven by emerging new and advanced technologies, increase in incidence of chronic diseases, and adoption of telemedicine solutions. 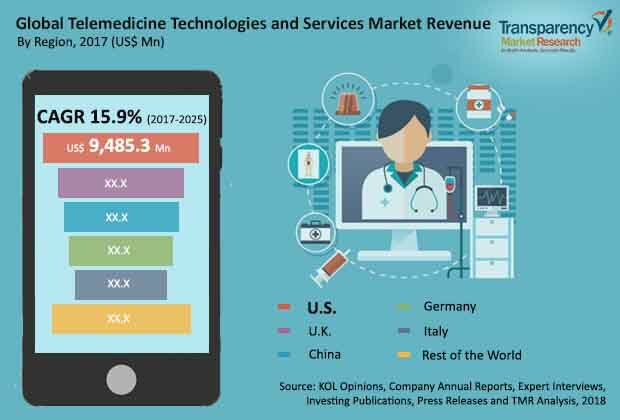 Rise in geriatric population, surge in prevalence of long-term care conditions, increase in demand for self-care, and advances in mobile penetration, connectivity, and ICT services are the other factors propelling the global telemedicine technologies & services market. However, disparity of Internet quality and cyber threats are the major restraints of the global telemedicine technologies & services market. The report offers detailed segmentation of the global telemedicine technologies & services market based on component, specialty, and services. The component segment has been divided into hardware, software, and services. The services sub-segment is poised to account for leading share of the component segment during the forecast period from 2017 to 2025. Rise in demand for different telemedicine services such as teleradiology, teledermatology, and telepsychiatry drive the market. The services sub-segment is likely to register comparatively higher growth rate in terms of revenue during the forecast period. The software sub-segment is estimated to expand at the second highest growth rate during the forecast period. In terms of specialty, the dermatology segment is projected to account for significant share of the global telemedicine technologies & services market during the forecast period. The neurology segment is likely to expand at a high CAGR from 2017 to 2025. Dominance of the segment is attributed to increase in geriatric population and emergence of cost-effective medical care. In February 2018, Masimo received the U.S. FDA approval for its product Eve for Rad-97 Pulse COOximete, a critical congenital heart disease (CCHD) newborn screening application. Such continuous new product launches and exponentially rise in patient base in developed as well as developing countries are likely to drive the segment between 2017 and 2025. The gynecology segment is expected to expand at a CAGR of 16% during the forecast period. The cardiology and orthopedics segments accounted for combined share of 30.0% of the global telemedicine technologies & services market in terms of revenue in 2016. In terms of revenue, the U.S. was the leading market for telemedicine technologies & services in 2016. Increase in prevalence of chronic diseases, rise in government initiatives, surge in the number of installations of telemedicine solutions in various clinics/hospitals, and presence of a large number of suppliers and service providers of telemedicine solutions contribute to the major share of the U.S. However, cyber threats and disparity of Internet quality are likely to hamper the market. Rise in venture capital funding for telemedicine solutions, surge in government initiatives for adoption of telemedicine, increase in geriatric population, and rise in prevalence of chronic diseases such as diabetes and heart diseases are the factors likely to drive the telemedicine technologies & services market in China. Government initiatives and grants to increase adoption of telemedicine solutions is expected to boost the market in the U.K. Rise in geriatric population, high percentage of people residing in remote locations, surge in government initiatives, and increase in penetration of smartphone and Internet services are likely to augment the market in India. The market in India is projected to expand at a CAGR of 25% from 2017 to 2025. The report also provides profiles of leading players operating in the global telemedicine technologies & services market. McKesson Corporation, F. Hoffmann-La Roche Ltd., Medtronic, Koninklijke Philips N.V., GE Healthcare, LifeWatch, and Honeywell International, Inc., among others are the major players in the market. Expansion of telemedicine technologies & services product portfolio through partnerships to improve quality of product is a growing trend in the global telemedicine technologies & services market. In January 2018, Royal Philips and American Well entered into a strategic partnership to deliver virtual care solutions across the world. In October 2017, Medtronic announced that its Medtronic Care Management Services (MCMS) business had entered into a strategic partnership with American Well. Other prominent players in the global telemedicine technologies & services market include Aerotel Medical Systems Ltd., GlobalMed, and AMD Global Telemedicine, Inc.